An exhibition 2 years in the making, this special collection of works by acclaimed artist David Atkins features the landscape of the beautiful counties of Devon and Cornwall. This exhibition coincides with the 4th anniversary of our Gallery space in Godalming. David is an 'En plein air' painter which has meant he's had to battle with the outdoor conditions to create each and every one of these landscapes. 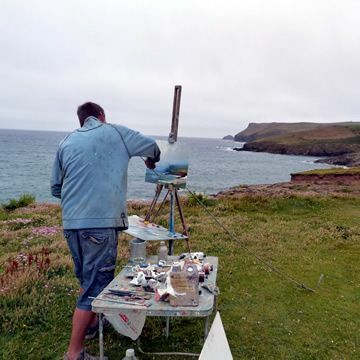 David has kindly offered to demonstrate his painting techniques in the Gallery on Saturday 7th September. There will be two viewing's, the first at 11am and the second at 2pm. Numbers will be limited for both of these and by appointment only. For further information and to reserve your space please contact the Gallery on 01483 860591.